Seafood lovers and fishermen alike will delight in this handsome gift arrangement featuring a bounty from the sea along with a keepsake picture frame, cutting board and more. The salmon we have carefully selected is wild caught right out of the Pacific Northwest. 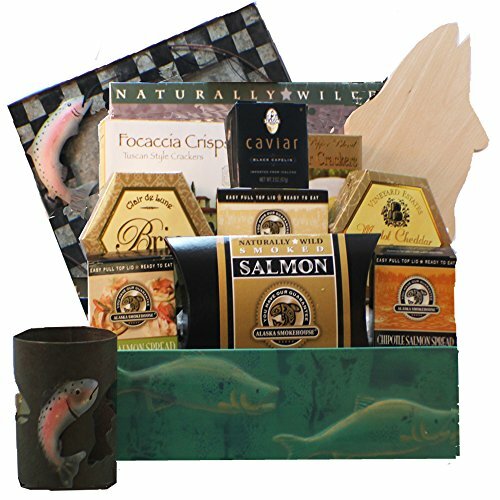 This gourmet snack sampler, paired with fishing themed knickknacks, makes a prime gift for Father’s Day, Birthdays, and every holiday in between. This arrangement makes a great gift for him or for her! Any grandpa, uncle, brother, friend- or even a teacher or corporate client, will feel blessed to receive such an extravagant sampler of snacks. Each basket is hand crafted with attention to detail, shrink wrapped and tied with a bow for presentation, ready for gift giving. Include a personalized message with your order by selecting GIFT during check out. Seafood lovers and fishermen alike will delight in this handsome gift arrangement featuring a bounty from the sea along with a keepsake picture frame, cutting board and more. The salmon we have carefully selected is wild caught right out of the Pacific Northwest. This gourmet snack sampler, paired with fishing themed knickknacks, makes a prime gift for Father's Day, Birthdays, and every holiday in between. This arrangement makes a great gift for him or for her! Any grandpa, uncle, brother, friend- or even a teacher or corporate client, will feel blessed to receive such an extravagant sampler of snacks. If you have any questions about this product by Art of Appreciation Gift Baskets, contact us by completing and submitting the form below. If you are looking for a specif part number, please include it with your message.